Here are the slides (3.32Mb) of my talk at Geoware called "The user experience of location-awareness", a very thoughtful event I've been invited to as a speaker by the Innovation Lab. Thanks Ander Morgensen, Christian Lausten and Peder Burgaard for the gig! The talk was basically a discussion about how multi-user location-aware applications have troubles reaching a more mature market. Starting from s-curves showing side-by-side the evolution of navigation systems (Garmin, TomTom) and location-aware apps, I described how the former are now well established and used by a large number of persons, whereas the latter still has trouble finding its market. The s-curves depicted different "waves" of locative systems, and stated how we're in a sorta disillusion phase (as represented on the Gartner Hype Cycle). This led me to show different quotes form trend reports that keeps postponing this ideal proximal future of powerful mososo. 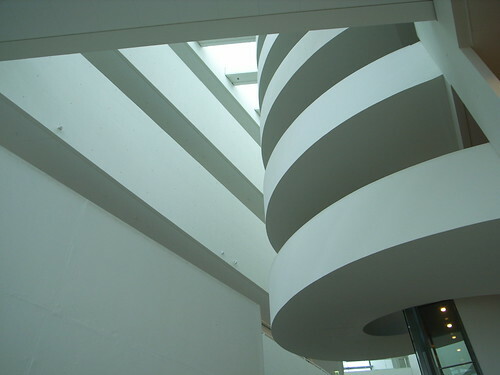 The picture shows the conference venue, ARoS, the Arhus Kunstmuseum.